"Today you are standing up for millions of Americans. 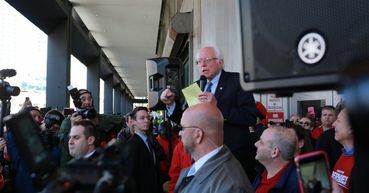 And you're telling corporate America they cannot have it all," Sanders told striking Verizon workers in New York City on April 13. Shared over social media, Judy. "Verizon paid Hillary $225,000 for speech and poured money into Clinton Foundation." *****************Green stars for Judy's reporting and presentation!! Whoa--Bernie Sanders is perhaps overly courageous, if there is such a thing---and I love his dear, honest soul for it!! I hear there are over 40,000 Verizon employees participating--and one presidential candidate!!! Also, for those who do not know--across Europe, in nations like Germany, France, Brussels--there is a veritable sea of peaceful protesters doing the "Occupy Protest" style. In the streets, staying overnight--this is the 13th day I believe. Media has been forbidden (?? By the 1%) to broadcast even a mention. It is only here and there online. Back to Bernie--bless him--he was an activist in the 60's and still has the inner fires burning. "Feel the Bern"?? He has true conviction to get the corruption out of government and other high places. He needs our support as much as we need his. This is one big corporation they're standing against and there will be more. The ball is rolling, globally. If anyone can't see who and what Bernie is now, they're fooling themselves and don't contribute toward trying to save what's left of Earth and all living--and trying to improve the quality and duration of all life. Go Bernie, Go!!! These greedy corporations don't realize they are strangling the geese that lay the golden eggs. Poorly paid workers can't buy stuff, and when nobody buys anything - KABOOM!